From left to right: Ryan Millar (Senior Director at Partners in Leadership), Kathy Neyman (Sr. Asst. VP Culture and Leadership Development at Redstone Federal Credit Union), Tracy Skousen (President International at Partners In Leadership), and Craig Hickman (Futurist and Senior Vice President of New Product Development at Partners in Leadership). 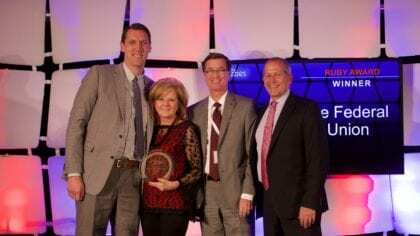 Temecula, Calif., June 13, 2017 (Newswire.com) – Partners In Leadership, the Accountability Training and Culture Change Company, awarded the 2017 Ruby Ozzie Award for overall achievement to Redstone Federal Credit Union, one of the top credit unions in the United States. The Ozzie Awards celebrate organizations that demonstrate excellence in accountability, leadership and culture through implementation of Partners In Leadership programs. “Accepting this award tonight is an individual who has much passion around impacting people’s lives through the culture they’ve created at Redstone Federal Credit Union,” Millar said before calling to stage Kathy Neyman, Sr. Asst. VP Culture and Leadership Development at Redstone Federal Credit Union, to accept the highest honor of the evening. Through its culture initiatives, RFCU has experienced breakthroughs in cross-collaboration and strategic alignment, surpassing its previous metrics and achieving maximum-tier goals. This success has contributed to the organization’s ability to increase the amount returned to members beyond dividends from $9.5 million in 2015, to $13 million in 2016. Prior to teaming up with Partners In Leadership, RFCU had been achieving success. However, that was not enough for the ambitious organization. “We asked ourselves, how much greater could we be if we got our culture right?” said Joe Newberry, CEO of RFCU. From 2014 to 2016, the company launched an enterprise-wide rollout of all of Partners In Leadership’s core programs, bringing accountability and culture training to all 850 employees across 24 branches. In September of 2016, the company went even further, offering the first-ever public workshop conducted by both Partners In Leadership and a client facilitator. “It’s all about people working together, people helping people to be the best that they can be, seeking to understand before being understood. And that’s what we live at the credit union, people helping people,” Neyman said. RFCU’ s tremendous success and ongoing commitment to not just their own culture, but their community as a whole, make this company a clear choice for Partners In Leadership’s highest 2017 Ozzie Award. Redstone Federal Credit Union® is a federally chartered credit union headquartered in Huntsville, Alabama and is regulated and insured by the National Credit Union Administration (NCUA). With nearly 400,000 members and $5 billion in assets, Redstone is the largest credit union in Alabama and among the 20 largest credit unions in the nation. To learn more, visit www.redfcu.org.